Godin asks "Are You Waiting For Your Cat to Bark?" Planning Persuasion Scenarios is the core of Persuasion Architecture and it ensures that that seller will leave a relevant scent of information based on answering each buyer's questions, addressing each need, each motivation, and even each buying preference. Whether the sale is complex or simple, whether the buyer is late or early in the process, whether the buyer is knowledgeable or ignorant, high price point or low, it doesn't matter. The seller must account for each customer segment and each angle of entry that customers may take as the need for your product arises. It isn't easy, it's a lot of work. Every touchpoint, every page, every keyword, every marketing communication must be accounted for . Persuasion Architecture handles this complexity. In today's landscape the seller is the only one with papable incentive to do the work of Persuasion Scenario planning, so it is unlikely that search or any other middle party will get too involved in solving this. And sellers selling these types of transactions simply can't afford to wait for search technology to solve this problem for them. Read Seth Godin's entire post. Advertising will always be with us. There will always be products, services, and circumstances that will warrant the use of advertising. Still, there can be no doubt that advertising as it is, as it was, must and WILL change dramatically. It all compounds into one simple dynamic. Customers are ignoring marketing, and today's advertiser is paying more for less return on their ad dollar. The old advertising template is broken, the carcasses of failed ad campaigns are piling up. The success of our new book is only one indication. Another nail in the advertising template's coffin comes to us courtesy of usability guru Jared Spool, whose research also confirms this with a loud echoing shout. Customers not only ignore advertising, they develop techniques to do so. Who can afford throwing more money at old school advertising and idly wait for their cats to bark? My thanks to Brian Massey of Hear This who was nice enough to organize a DiviCast (slides plus audio) of my presentation at the Austin, TX American Marketing Association luncheon. Would you like to see the presentation? Mike Drew just called to let me know that "Waiting For Your Cat To Bark?" debuts on BusinessWeek's monthly Hardcover Business Book list at #7. This list is monthly, as opposed to the others that are weekly, so we've been waiting. Bryan, Lisa and I are so grateful to everyone who helped us with this book and to all of you wonderful people who bought and read it. You have read it already, right? Crackvertising - Are You Addicted? 1)The addiction to and/or business dependency on low cost traffic from Google search and other search advertising. Signs of addiction include; needing more and more traffic to convert the same amount of sales, paying more and more for less and less traffic; and finally the advertiser's life becomes obsessed with the next 'fix' of traffic. Lack of, reduction of, or fluctuation of paid traffic results in severe withdrawal. The effect is usually a corresponding and parallel fluctuation in top line sales. The potency of the drug (traffic) declines over time, and the addict needs greater amounts to satisfy addiction. This addiction displays all of the common trademarks associated with a dealer/addict based relationship. 1)Dealer provides low or no barrier of entry to try product. In this case Google hosts a perpetual party where Google gives out free 'traffic' in the form of organic search results referrals. Once the addict experiences free traffic the addict is offered better access to traffic(impressions) and is charged when traffic shows interest in the addict by clicking on a search advertisement. 2)Price of entry rises. At first this charge per click is minimal, but as other addicts are willing to pay more for the same click prices rise creating financial tension for the addict as the addict struggles to buy more and more traffic. 4)Addict displays common love/hate attitude towards dealer. 5)Dealer uses and develops more techniques to keep the advertiser addicted. The Cure - Weaning a company off this addiction is not easy, takes time and is typically very painful. To begin the road to recovery the addict must first turn their attention away from driving new traffic and towards satisfying current traffic. The first step in breaking any addiction is admitting you have a problem. If you know of anyone who may be addicted please send them this link right away. Etymology - "Crackvertising" is word coined by Future Now, Inc.'s Bryan Eisenberg on June, 2006 Staff Training. Like this article? Digg it? Jeff Jarvis strikes again. I know my brother Jeffrey blogged about him recently. And we reference him in connection to his "Dear Mr. Dell" post in "Waiting For Your Cat To Bark?". This time Jeff blogs about some terrifying statistics about the book market. Did you know that 58% of the US adult population never reads another book after high school? It gets worse than that. Only read his post if you want to spend the weekend depressed. We know roughly how few books it took for us to hit #1 on the Wall Street Journal's Business best-seller list this week. Are you as concerned about this active illiteracy as we are? "Waiting for Your Cat to Bark?" will be most instructive to the advertising crowd, of course. It's hard to find a book about marketing that is truly appropriate for anyone but people who practice the stuff. But general readers may find something valuable here too: the latest Madison Avenue methods for getting inside their brains and massaging their decision-making logic. If the Web offers marketers new opportunities, it also allows picky consumers to become -- with a feline cleverness and caution -- ever more finicky. Brian references our book in the context of the ad agency BBDO, a poster child for the Madison Ave. glitz and glamour brand marketing philosphy. On the opposite end of the marketing philosophy spectrum you would find the direct marketing philosophy , as represented by the president of the Direct Marketing Association John A. Greco, who also reviewed our book. Seems that all ends of the marketing spectrum see value in Persuasion Architecture. I'm reserving my final opinion on the Dell blogging experiment. I'll give them a few months to see if the net effect of publishing their blog is positive or not. I don't expect anything great from Dell. Their culture is simply too focused on numbers over people, too inward looking and creatively constipated. However, this experiment may open them up a bit and they need every little bit they can get. Craig Danuloff came closest to expressing my views in his post: "Blogging Into A Buzz-Saw : The New Dell Blog"
Nevertheless, the entire discussion has kept me amused. Don't miss out on the fun. Read Jeff Jarvis's blog post along with the comments; I had a good laugh. Ensure that your landing page is relevant to your keywords and your ad text. Distinguish sponsored links from the rest of your site content. Try to provide information without requiring users to register. Or, provide a preview of what users will get by registering. In general, build pages that provide substantial and useful information to the end-user. If your ad does link to a page consisting of mostly ads or general search results (such as a directory or catalog page), provide additional information beyond what the user may have seen in your ad or on the page prior to clicking on your ad. You should have unique content (should not be similar or nearly identical in appearance to another site). Users should be able to easily find what your ad promises. Openly share information about your business. Clearly define what your business is or does. Deliver products, goods, and services as promised. The above is not ground breaking advice from a Conversion Rate specialist. The above is taken directly from the Google Adwords help center. Basic, common sense, and sound advice for any Adwords advertiser to increase their conversion rate, right? All these guidelines sound simple, not impossible, and stir up a resounding "Duhhh, of course we should be doing that" thought in your head right? But why are so few doing it? Is it the Diet Coke diet phenomenon? Are some advertisers thinking that if they order a triple deck burger, super large fries and a DIET coke that they are actually on diet? Is PROVIDING RELEVANT AND SUBSTANTIAL CONTENT really that hard? Well improving conversion IS alot like dieting, easy in concept(eat less, burn more calories), but a little bit more difficult in practice. Planning relevant, persuasive scenarios from an Adwords ad(driving point) to the landing page(funnel point) on through to the final conversion process(conversion beacon) is tough, daunting, and often complex work. Anything worthwhile usually is. Well if you just needed a little more incentive to improve your Google Adwords campaign, I've got good news for ya! Google is going to start charging you more for low quality landing pages. Get relevant or get broke. 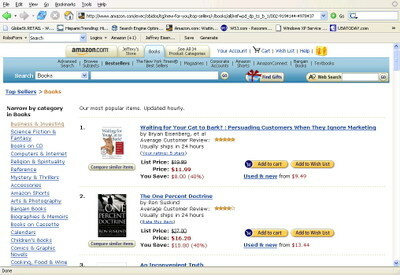 Waiting For Your Cat to Bark is now a #1 best seller! Thanks for the support. Oh and if you don't have a copy or three, what'r you waiting for?